EALING COMMON/EALING BROADWAY District/Piccadilly lines. 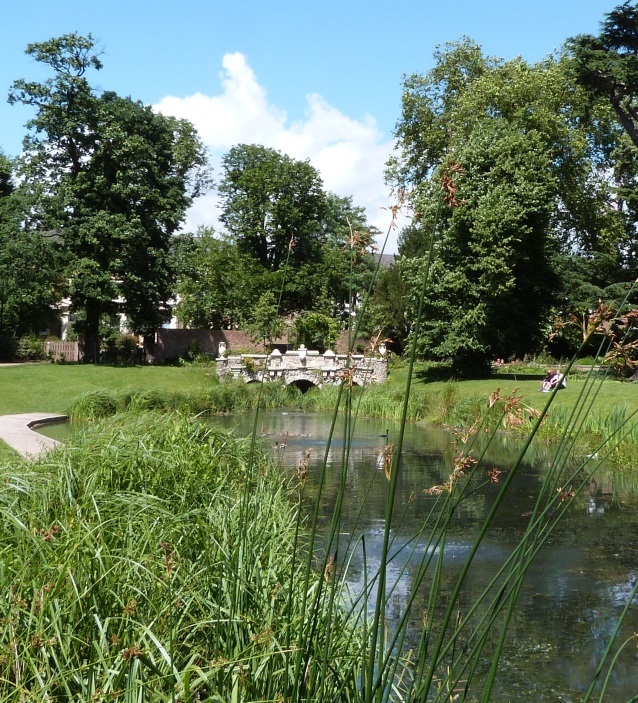 This route of about 2½ miles takes you from the village atmosphere of South Ealing to the bustle of Ealing Broadway. As you approach ground level at Ealing Common station check out the windows - their Tube logo design blends perfectly with the simplicity of the seven-sided ticket hall (Charles Holden 1931). On leaving, turn left, cross Leopold Road and potter down the path that goes through leafy Ealing Common. Note the cast-iron lamp posts. These were under threat of replacement in 2006, but local residents kicked up such a fuss that eventually it was agreed that instead of being scrapped, the lamps could be modernised. Watch out for them - they can be found throughout the area. At the junction with the main road (North Circular) cross to Warwick Road on the left. About five minutes later, pass over The Common, and go right. Almost immediately you will see the sign for St Matthew’s Road. This is a delightful cul-de-sac of Victorian artisan cottages that were occupied by agricultural labourers, blacksmiths, etc. working on the many market gardens in Ealing. 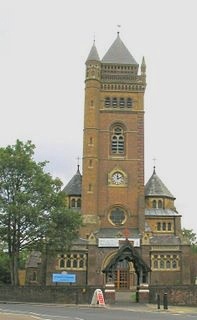 Next comes its twin, St. Mark’s (Vine Place), where the temptation to put in bay windows has been better resisted. Retracing your steps, pass the Grange Tavern and go to the right down Warwick Road. One side of this is lined with big Victorian houses with interesting brickwork decorations. 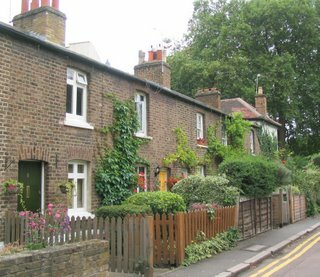 After about five minutes, the road changes character, with an terrace of early Victorian town houses followed by a run of cottages. Opposite, in Warwick Place is another collection of artisan cottages and a small industrial building, now a film school. The end of the road is dominated by the University of West London - it has a somewhat ghostly sculpture by the entrance. Turn left into St. Mary's Road, cross towards The Castle Inn and walk left again. On the corner of Beaconsfield Road is the old Industrial School (1867). At No. 58 St. Mary's Road, the Clock House has two timepieces, a giant one overhanging the pavement, the other more discreetly placed above the door. If you pop into the cul-de-sac nearby you'll come upon more cottages. 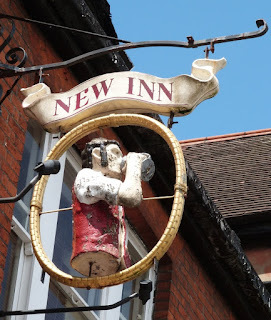 Back in the main road, New Inn has a plaque commemorating Queen Victoria's Diamond Jubilee. The pub sign is somewhat gruesome - looks as if it came from a fairground. Nos. 72 and 74, a pair of tall brick buildings covered in creeper, were once part of the old Work House. 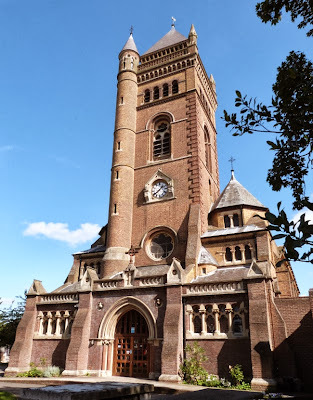 Cross over to St. Mary’s church.The previous building was altered by S.S. Teulon in the mid nineteenth century, who transformed it into a spectacular polychrome building that has been described as 'elephantine'. 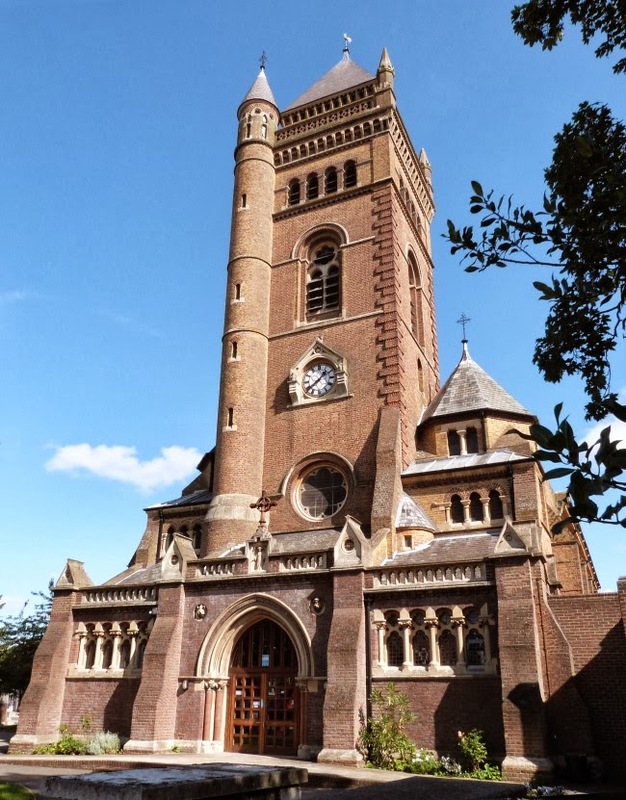 However, Inside, the delicate woodwork of the roof gives a golden glow to the spacious nave, while the windows have ochre and red striped brick arches. A demure, grey, parish church it is not. It is best to check here for contact details to get opening times before making a special journey, but in any case you will be able to wander round the churchyard, the eastern part of which is a wild flower garden with meandering path. After leaving the church, cross Church Gardens and make for some trees. These are in tiny St. Mary’s Square. The plain brick building with red doors was part of the old Fire House, built in 1888. Opposite, on the corner of Church Lane, is the handsome early nineteenth-century Westfield House, used as a social club. Now for a fifteen minute green wander to reach the more urban Ealing Broadway. To get to this peaceful route, cross St. Mary's Road and turn left, passing St.George's Avenue and following Church Lane as it bends to the right. At the entrance to Lammas Park it becomes Culmington Road. Follow this a few minutes until Lammas Park Gardens. The entrance to Walpole Park is immediately on the left. 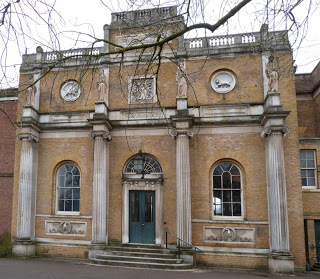 This is part of the Pitzhanger Manor estate. The Grade 1 listed building, situated at the northeastern end of the park, was bought in 1800 by John Soane, at that time architect and surveyor to the Bank of England. He re-designed it in the next few years, planning it as an escape from the noise and bustle of London life. 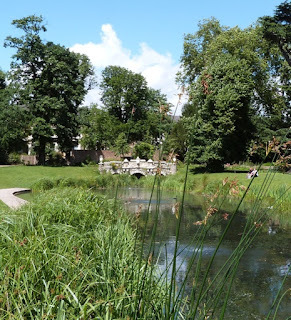 Apart from swathes of grass, a rose garden and ancient trees, the park has two water features, one of which is a pretty pond/stream with stone bridge designed by Soane himself. A large play park with exciting wooden structures provides fun for kids. Something for everyone. Please note that the house itself is closed until 2019 for a major restoration programme. After exploring the park, exit at Mattock Lane (behind the stone bridge) and turn right. At the Pitzhanger Manor brick archway take the path to the right through Ealing Green. 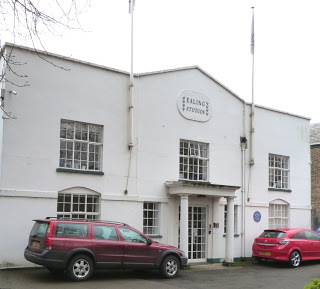 Just past a college and Georgian house is the modern entrance to Ealing Studios. On the corner is an attractive Victorian brick building (once a girls' school, now a Jehovah's Witness church). Continue walking. 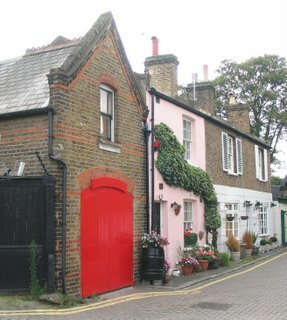 At the end of a row of charming c.1840 cottages is a white building - the original studios. 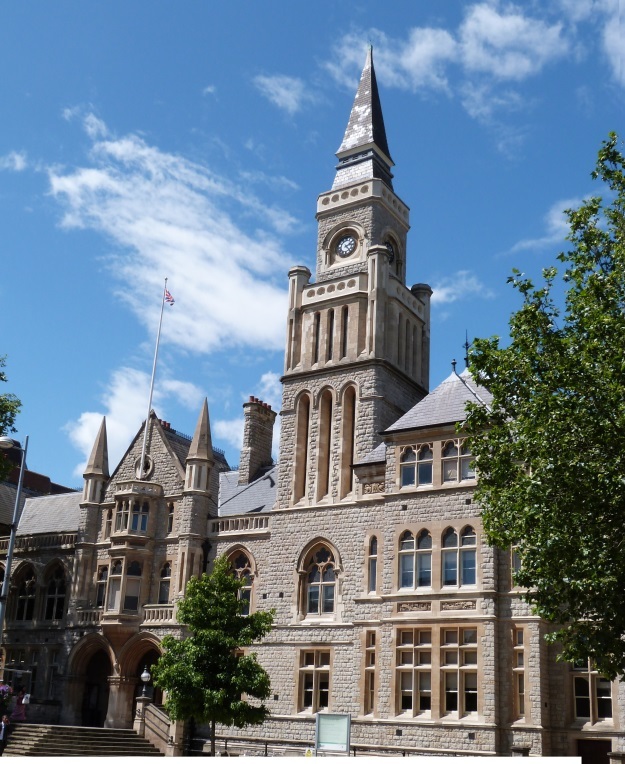 Among the much-loved films produced in Ealing are: Passport to Pimlico, Kind Hearts and Coronets, Whisky Galore! (all 1949), The Man in the White Suit (1951), and The Ladykillers (1955). A few metres on is The Lawn (early Victorian) with a coach house and clock on the central pediment. Need reviving? A little further down on the opposite side of the road is the Red Lion pub advertising ‘Fuller & Co’s Fine Chiswick Ales’ in huge black letters. This traditional London pub has been a Fullers house since 1845,and is the watering hole for the studios. A signboard announces that it is known as Stage Six (in the tradition of the nineteenth hole in golf, the studios originally having had five stages). From the Red Lion turn right (in the direction of the Broadway), passing yet more neat artisan cottages. After crossing The Grove (third turning) you will find a row of small shops, many with original frontages. Proceed straight ahead down the High Street, which has a massive shopping centre. Left into New Broadway. 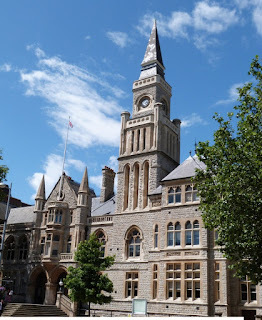 Soon after Bond Street go over the road to see the impressive 1888 ragstone Town Hall. Turn right and walk along New Broadway, passing the Victorian Church of Christ the Saviour, by Gothic Revival architect G. G. Scott. Cross Spring Bridge Road and continue ahead until the junction with The Mall. Look across the road to see the North Star pub with colourful carving at eaves level (barge-boards). 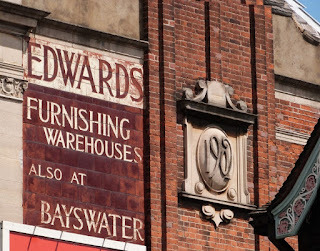 Adjacent to this, high up on the opposite wall, is an old painted advertisement for Edwards Furnishing Warehouse - and don't miss the plaster work on the large building on the corner as you go left towards the station. 'The Feathers Restaurant 1929' conjures up visions of bygone days and indeed there was a pleasure garden on the adjoining land before it was used for the Great Western Railway in 1838. The station is not endearing. It's an early 1970's concrete building of extreme dreariness, topped by a menacing high-rise office block. All this is particularly surprising as Ealing Broadway is a terminus. 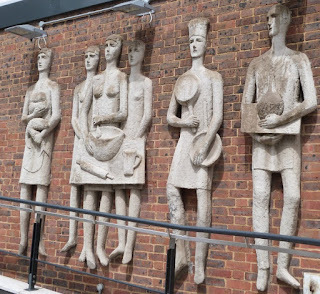 Photographs of previous stations can be seen in this London Transport Museum PDF file. However, for Tube nerds like myself there are gems within. 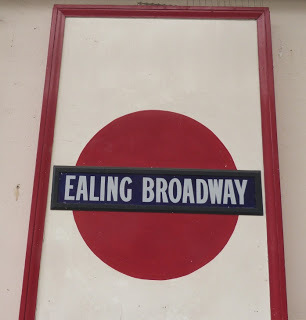 The iconic round sign has not always had the same appearance, and there are several examples of the 1908 version (not all original) on the District Line platforms. This is just one route from the many to be found at London Tube Rambles. There are architectural gems, beautiful country views, historic places and quirky buildings to be found in the outer London Underground area. Usually the discoveries are within a mile of the Tube - often only five minutes walk away. If you reached this as an individual page via a search engine, you might like to click on the link above and see the other destinations explored. You'll be amazed at what's out there!